When I heard from various social media sources that the fresh truck was to be parked on Bleecker street one day, I promised myself to stop by and pick up some samples. Normally I don't care much for promotional tote bags, but this one turned out to be quite nice. What a cute trio, n'est pas? (The two on the left I received thanks to the Sephora Insider birthday present program) I was hoping to get a sample of their sugar lip scrub as well, but unfortunately it was only being given if you purchased their face cleanser and toner set right then and there. To be fair, they were offering the set at a deep discount as part of the promotion - $40 instead of $80. The sales woman seemed a little taken aback that I wasn't taking the bait! 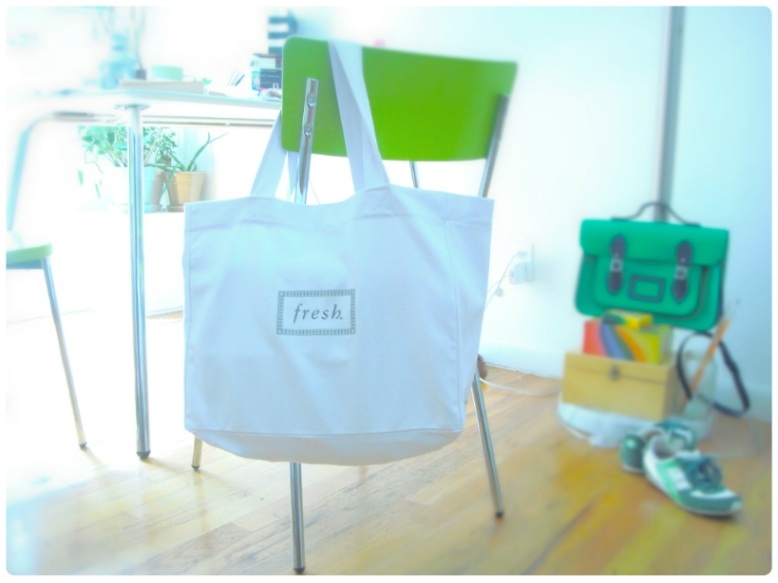 fresh products are beautifully packaged and designed; they feel amazing and work well. For now though, I'd rather spend my $40-$80 on high end cosmetics, for instance, any of the NARS blushes, and not on something as basic as a face wash which is easy to get right for so much less. However, believe you me I understand the appeal of fancy basics.